A lower serum magnesium in people with epileptic seizures compared with healthy controls have been demonstrated,,,,,,, with studies reporting a positive correlation of hypomagnesemia with severity of epileptic seizures.,, However, the duration of epilepsy or treatment with antiepileptic therapy has no significant influence on serum magnesium., It has been observed that disturbances in magnesium homeostasis usually do not exist alone, rather it parallels those of other trace elements. Few studies in Black Africans have looked at the association between serum magnesium and epilepsy;, however, no study to the best of our knowledge has looked at the differences in people with idiopathic generalized epileptic (IGE) seizures and symptomatic seizures in Nigeria. This study investigated the difference in the level of serum magnesium in adult patients with IGE and symptomatic epileptic seizures on antiepileptic drugs (AEDs) therapy and compared that with the level in healthy controls. It also correlated the frequency of seizure with the serum level of magnesium and determined the level of potassium, phosphates, calcium, and albumin. This is a hospital-based analytical cross-sectional study conducted at the University of Maiduguri Teaching Hospital (UMTH) and the Federal Neuro-Psychiatry (FNPH), Maiduguri. The two hospitals serve as the main epilepsy referral centers for northeast Nigeria. The study was approved by the Ethical Committees of UMTH and FNPH, Maiduguri, and all provisions of the Declaration of Helsinki regarding participation were followed in the study. Sixty subjects age 18 years and above with the diagnosis of epilepsy fulfilling the International League Against Epilepsy (ILAE) criteria  were recruited consecutively as they attended the outpatient clinics of the two hospitals. Thirty healthy controls were recruited among the healthcare personnel working in these centers and among patients' relatives who never had a seizure. We excluded people on magnesium-containing drugs such as antacids and traditional medications; patients with gastrointestinal disorders such as chronic diarrhoea and malabsorption syndromes; patients with disorders such as hyperthyroidism and diabetic ketoacidosis; those on diuretics such as frusemide, thiazides, and acetazolamide; alcoholics; patients with chronic renal disease; and pregnant females. Subject's sociodemographic and full medical history were obtained. The age of seizure onset, duration of symptoms before hospital presentation, diagnosis of seizures, seizure characteristics, numbers of seizure attacks, and medications (AEDs) used were recorded. The results of serum magnesium, calcium, potassium, phosphates, and albumin were recorded in all the study subjects. Computerized tomography (CT) scan of the brain and electroencephalography (EEG) were done in all the cases, and the parameters obtained were used to classify cases into either IGE seizures (no identifiable cause) or symptomatic seizures (those with an identifiable risk factor, both acute and chronic). Study subjects were stratified into three groups: patients with IGEs, patients with symptomatic seizures, and apparently healthy controls. Five milliliters of venous blood sample was obtained in the morning from all subjects to measure the serum magnesium, calcium, potassium, phosphorus, and albumin levels. Samples were centrifuged at the rate of 1500 rpm for 5 min utes. At least 1 mL of serum was immediately separated from the clot and transferred into two separate acid-washed plain bottles. One bottle containing the serum was stored at –20°C for later analysis of serum magnesium at National Agency for Food and Drug Administration Control (NAFDAC) zonal laboratory, Maiduguri, whereas serum calcium, potassium, phosphate, and albumin were analyzed immediately at the chemical pathology laboratory, UMTH. Magnesium level was determined by atomic absorption spectrophotometry using AA-6800 series Shimadzu atomic absorption spectrophotometer (Shimadzu Corporation, Kyoto, Japan). Frozen serum samples transported to the NAFDAC laboratory were allowed to thaw at room temperature. A sufficient dilution amount of lanthanum oxide solution (La) was prepared for the analyses to avoid interference by phosphate ions. Determination by atomic absorption spectroscopy is based on the fact that atoms of an element in the “ground” or unexcited state absorb light of the same wavelength as that emitted by the element in the excited state. Magnesium absorption wavelength is 285.2 nm. The direct spectrophotometric analysis used in this study is the most reliable based on the technology available in Nigeria at the time of the study. On the basis of precision and accuracy, it is a preferred method, and the coefficient of variation in the precision of the assays in the normal range is 8%–14%. Serum calcium, phosphorus, and albumin were analyzed colorimetrically using Arsenazo III, molybolate, and bromocresol green methods with DIALAB, Human, and Radox Diagnostics Kits, respectively. Potassium was determined using standard flame emission spectrophotometry method. About a quarter of serum magnesium is bound to albumin, hence serum albumin level is needed to measure the true serum Mg level. We calculated the sample size to be at least 55 people with epilepsy. Data generated were entered into “SPSS Version 16.0” (SPSS Inc., Chicago, IL, USA) and analyzed. Descriptive summaries were expressed as means ± standard deviations and percentages for numerical and categorical variables, respectively. A Chi-square test (or Fisher's exact test) was used to compare categorical variables, whereas an independent sample t-test was conducted to compare means. Pearson's correlation coefficient (r) was used to test the strength of association between variables. The level of significance was set at P < 0.05. We recruited 60 subjects (31 males and 29 females) with epilepsy and 30 controls (15 males and 15 females), with a mean age of 35.9 ± 12.0 and 33.7 ± 13.4 years, respectively. There were no significant differences in the sociodemographic characteristics of the cases and controls. [Table 1] shows the sociodemographic and clinical characteristics of the 40 persons with IGE seizures and 20 with symptomatic seizures. Those with IGE were significantly younger compared with those with symptomatic seizures (mean age 28.3 ± 8.2 and 43.5 ± 15.7 years; P < 0.001). There were 22 (55%) females and 18 (45%) males with IGE, and 13 (65%) were males and 7 (35%) were females among those with symptomatic seizures. Sixteen (40%) of the IGE cases had a family history of epilepsy compared with 15% of those with symptomatic seizures. Three (7.5%) of the IGE cases had febrile convulsions and 31 (77.5%) had no significant medical history. The age of seizure onset for those with IGE were predominantly below the age of 20 years, whereas those with symptomatic seizures were mostly above 20 years. We observed that 40% of the IGE cases presented to the hospitals for the first time for diagnosis after 5 years of seizure onset compared with none among the symptomatic cases (P = 0.004), whereas a majority (85.0%) of the symptomatic seizure cases presented within the same month compared with 15% of those with IGE (P = 0.001). All the IGE cases had episodes of generalized tonic–clonic seizure compared with 25.0% of symptomatic seizure cases (P = 0.008). Most of the symptomatic cases (70%) had partial seizures with secondary generalization compared with none among IGE case (P < 0.001). At the time of diagnosis, 14 (35%) of the patients with IGE had a frequency of three to five seizure attacks per month, 12 (30%) had two seizures per month, and 8 (20%) had one seizure per month. While 8 (40%) with symptomatic seizure had three to five seizure attacks per month, 5 (25%) had two seizures per month, and three (15%) had one seizure attack per month. There were no statistical differences between the two groups regarding seizure frequency. 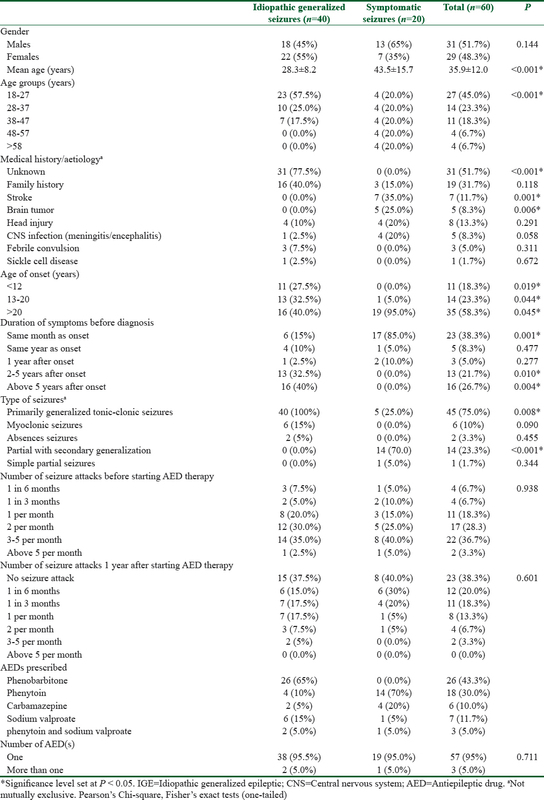 A year after commencing AED, 37.5% IGE cases were seizure-free, whereas 40% of the symptomatic cases were seizure-free, with no significant difference. The majority were on one AED, with phenobarbitone being the most (65%) prescribed for IGE case and phenytoin (70%) for symptomatic seizures. These drugs are the most readily available and affordable. In all, 25 (62.5%) patients with IGE and 18 (90%) symptomatic seizure cases were compliant to medication based on the word-of-mouth. Thirty-four (85%) cases of IGE and six (30%) among the symptomatic group used other forms of nonorthodox therapy. All the 40 cases with IGE had a normal CT brain. Seven (35%) of symptomatic seizure cases had features of stroke, five (25%) had features of brain tumors, four (20%) had features of traumatic brain injury, and four (20%) had features of central nervous system infections. The routine awake EEG were normal in 36 (90%) cases of IGE and showed generalized epileptiform activities in only 4 (10%) cases. The mean serum magnesium, calcium, potassium, phosphate, and albumin in cases and controls is shown in [Table 2]. The serum magnesium was significantly lower among the 60 cases compared with the control (0.79 ± 0.18 mmol/L vs 0.90 ± 0.17 mmol/L; P = 0.007). The mean serum calcium in the 60 cases was significantly lower than the control cases (2.3 ± 0.13 mmol/L vs 2.4 ± 0.12 mmol/L; P < 0.001). There was no significant difference between serum potassium, phosphate, and albumin levels in the 60 cases and controls. [Table 3] shows that the mean serum magnesium in patients with IGE was significantly lower than the controls (0.74 ± 0.17 mmol/L vs 0.9 ± 0.17 mmol/L; P < 0.001). Similarly, the mean serum calcium in the IGE cases was significantly lower than that of the control (2.3 ± 0.13 mmol/L vs 2.4 ± 0.12 mmol/L; P = 0.002), there was no significant difference in the serum potassium, phosphate, and albumin. [Table 4] shows no significant difference in the serum magnesium, calcium, potassium, phosphate, and albumin between cases of symptomatic seizures and controls. [Table 5] shows that the serum magnesium and calcium levels in the cases of IGE were significantly lower than the level in the symptomatic seizure cases (P = 0.001 and 0.012), with no significant difference in serum potassium, phosphate, and albumin. There was no significant correlation between the number of seizure attacks before starting therapy and 1 year after starting AED therapy with serum magnesium level among both cases of IGE and symptomatic seizure (rs = 0.065, P = 0.62; rs = 0.01; P = 0.94, respectively). Our study shows that patients with IGE had significantly lower magnesium and calcium compared with those with symptomatic seizures and controls, even though both values were within the reference interval. Although there are few studies on serum magnesium in patients with epilepsy in Nigeria,, our study is the first to consider its role in idiopathic versus symptomatic seizures in adult patients in northern Nigeria. Oladipo et al., reported a similar finding among Nigerian adults and children, but with no associated significant difference in calcium level. Similar studies have revealed lower magnesium levels in epileptics than in controls ,,, and an associated significant increase in the serum calcium level in epileptic in the interictal and postictal periods. In contrast, Hamed et al. and Smith and Bone  reported no significant difference in serum magnesium between epileptics and controls. Our study showed no significant difference in serum magnesium level between symptomatic cases and controls in this study, whereas the mean serum magnesium and calcium level in the IGE cases was significantly lower than the level in the symptomatic cases and controls. These findings suggest that lower serum magnesium may play a role in people with IGE; however, no correlation was found with seizure frequency. Other similar studies revealed no relationship between the level of serum magnesium and severity of seizure attacks.,,, Gupta et al. observed significantly lower serum magnesium level in patients with idiopathic epilepsy than in controls, and the serum magnesium level was lower in those with severe epilepsy compared with those with mild to moderate epilepsy. This study had several limitations. First, we measured the total free magnesium levels rather than ionized magnesium which would have given a better level of physiologically active form that is in equilibrium with the intracellular magnesium. The most preferably method would have been to measure the intracellular concentration of magnesium in erythrocytes, since magnesium is predominantly an intracellular cation. Serum magnesium levels may not truly reflect intracellular magnesium levels, and the finding of lower serum magnesium levels may simply be an epiphenomenon rather than a true pathophysiological finding. Second, due to cost, CT was used to differentiate IGEs from symptomatic seizures instead of magnetic resonance imaging which is most appropriate for diagnosis of cerebral abnormalities in epilepsy., However, CT has been found to be both sensitive and relatively specific for identifying the presence of lesions like tumors, stroke, arteriovenous malformations, and some infective lesions. Third, the level of serum magnesium was not measured at the time of diagnosis before commencing AEDs, and we did not analyze our data based on the type of AED patients were taking. Studies have shown that treatment with valproate may increase serum magnesium concentration in treated patients compared with untreated patients , Fourth, this study did not consider the effect of age or gender on serum magnesium level. Most of our IGE cases were significantly younger compared with symptomatic cases. Studies have observed no appreciable age influence on the effect on serum magnesium on epilepsy. While studies have observed no gender difference in magnesium levels,, the study by Prasad et al. reported lower serum calcium in females compared with males. Finally, we acknowlegde the lower sample size for the controls; this may have affected the statistical power of the study. The findings in this study demonstrate that serum magnesium level may play an important role in epilepsy especially in people with IGE. These findings are inconclusive and would require further studies, as it will be difficult to conclude that the lower serum magnesium level found in patients with IGE was a contributory trigger to seizure generation or propagation, or were as a result of the diseases or the influence of medications. Based on the findings in this study, the next step will be to study the underlying mechanisms and genetic susceptibility of hypomagnesemia in people with IGE. The benefit of treating hypomagnesemia calls for translational research, with robust trials to inform clinical practice, but such trials cannot be undertaken without basic epidemiological data from various populations. This work was carried out at the UMTH and FNPH, Maiduguri. The authors would like to acknowledge the staff of the NAFDAC laboratory and those of the chemical pathology department, UMTH, for their assistance with chemical analysis. Fisher RS, Acevedo C, Arzimanoglou A, Bogacz A, Cross JH, Elger CE, et al. ILAE official report: A practical clinical definition of epilepsy. Epilepsia 2014;55:475-82. Reinhart RA. Magnesium metabolism: A review with special reference to the relationship between intracellular content and serum levels. Arch Intern Med 1988;148:2415-20. Slutsky I, Abumaria N, Wu L-J, Huang C, Zhang L, Li B, et al. Enhancement of learning and memory by elevating brain magnesium. Neuron 2010;65:165-77. Hartwig A. Role of magnesium in genomic stability. Mutat Res Fund Mol Mech Mut 2001;475:113-21. Mazur A, Maier JA, Rock E, Gueux E, Nowacki W, Rayssiguier Y. Magnesium and the inflammatory response: Potential physiopathological implications. Arch Biochem Biophys 2007;458:48-56. Li F-Y, Chaigne-Delalande B, Kanellopoulou C, Davis JC, Matthews HF, Douek DC, et al. Second messenger role for Mg2+ revealed by human T-cell immunodeficiency. Nature 2011;475:471-6. Long S, Romani AM. Role of cellular magnesium in human diseases. Austin J Nutr Food Sci 2014;2. Hamed SA, Abdellah MM, El-Melegy N. Blood levels of trace elements, electrolytes, and oxidative stress/antioxidant systems in epileptic patients. J Pharmacol Sci 2004;96:465-73. Nechifor M, Vaideanu C, Palamaru I, Borza C, Mindreci I. The influence of some antipsychotics on erythrocyte magnesium and plasma magnesium, calcium, copper and zinc in patients with paranoid schizophrenia. J Am Coll Nutr 2004;23:549S-51S. Alexander PE, Van Kammen DP, Bunney W. Serum calcium and magnesium in schizophrenia: Relationship to clinical phenomena and neuroleptic treatment. Br J Psychiatry 1978;133:143-9. Athanassenas G, Papadopolos E, Kourkoubas A, Tsitourides S, Gabriel J, Hoidas S, et al. Serum calcium and magnesium levels in chronic schizophrenics. J Clin Psychopharmacol 1983;3:212-6. Ruljancic N, Mihanovic M, Cepelak I, Bakliza A. Platelet and serum calcium and magnesium concentration in suicidal and non-suicidal schizophrenic patients. Psychiatry Clin Neurosci 2013;67:154-9. Tarleton EK, Littenberg B. Magnesium intake and depression in adults. J Am Board Fam Med 2015;28:249-56. Derom M-L, Sayón-Orea C, Martínez-Ortega JM, Martínez-González MA. Magnesium and depression: A systematic review. Nutr Neurosci 2013;16:191-206. Serefko A, Szopa A, Wlaź P, Nowak G, Radziwoń-Zaleska M, Skalski M, et al. Magnesium in depression. Pharmacol Rep 2013;65:547-54. Widmer J, Henrotte J-G, Raffin Y, Bovier P, Hilleret H, Gaillard JM. Relationship between erythrocyte magnesium, plasma electrolytes and cortisol, and intensity of symptoms in major depressed patients. J Affect Disord 1995;34:201-9. El Baza F, AlShahawi HA, Zahra S, AbdelHakim RA. Magnesium supplementation in children with attention deficit hyperactivity disorder. Egypt J Med Hum Genet 2016;17:63-70. Irmisch G, Thome J, Reis O, Häßler F, Weirich S. Modified magnesium and lipoproteins in children with attention deficite hyperactivity disorder (ADHD). World J Biol Psychiatry 2011;12:63-5. Kozielec T, Starobrat-Hermelin B. Assessment of magnesium levels in children with attention deficit hyperactivity disorder (ADHD). Magnesium Res 1997;10:143-8. Ramadan N, Halvorson H, Vande-Linde A, Levine SR, Helpern J, Welch K. Low brain magnesium in migraine. Headache 1989;29:590-3. Schoenen J, Sianard-Gainko J, Lenaerts M. Blood magnesium levels in migraine. Cephalalgia 1991;11:97-9. Taubert K. Magnesium in migraine. Results of a multicenter pilot study. Fortschr Med 1994;112:328-30. Weaver K. Magnesium and migraine. Headache 1990;30:168. Huguet F, Calvez M, Benz N, Le Hir S, Mignen O, Buscaglia P, et al. Function and regulation of TRPM7, as well as intracellular magnesium content, are altered in cells expressing ΔF508-CFTR and G551D-CFTR. Cell Mol Life Sci 2016;73:3351-73. Kopito L, Elian E, Shwachman H, Rossen E. Sodium, potassium, calcium, and magnesium in hair from neonates with cystic fibrosis and in amniotic fluid from mothers of such children. Pediatrics 1972;49:620-4. Li C, Ramjeesingh M, Wang W, Garami E, Hewryk M, Lee D, et al. ATPase activity of the cystic fibrosis transmembrane conductance regulator. J Biol Chem 1996;271:28463-8. Sanders N, Franckx H, De Boeck K, Haustraete J, De Smedt S, Demeester J. Role of magnesium in the failure of rhDNase therapy in patients with cystic fibrosis. Thorax 2006;61:962-6. Galland L. Magnesium, stress and neuropsychiatric disorders. Magnesium and trace elements 1993;10:287-301. Saghazadeh A, Mahmoudi M, Meysamie A, Gharedaghi M, Zamponi GW, Rezaei N. Possible role of trace elements in epilepsy and febrile seizures: A meta-analysis. Nutr Rev 2015;73:760-79. Gupta S, Manhas A, Gupta V, Bhatt R. Serum magnesium levels in idiopathic epilepsy. J Assoc Physicians India 1994;42:456-7. Iihan A, Uz E, Kali S, Var A, Akyol O. Serum and hair trace elements levels in patients with epilepsy and healthy subjects: Does the antiepileptic therapy affect the element concentrations of hair. Eur J Neurol 1999;6:705-9. Oladipo O, Ajala M, Okubadejo N, Danesi M, Afonja O. Plasma magnesium in adult Nigerian patients with epilepsy. Niger Postgrad Med J 2003;10:234-7. Oladipo O, Lesi F, Ezeaka V. Plasma magnesium and calcium levels in children with epilepsy in lagos. Niger Postgrad Med J 2007;14:26-9. Prasad D, Shaheen U, Satyanarayana U, Prabha TS, Jyothy A, Munshi A. Association of serum trace elements and minerals with genetic generalized epilepsy and idiopathic intractable epilepsy. Neurochem Res 2014;39:2370-6. Sood A, Handa R, Malhotra R, Gupta B. Serum, CSF, RBC & urinary levels of magnesium & calcium in idiopathic generalised tonic clonic seizures. Indian J Med Res 1993;98:152-4. Benga I, Baltescu V, Tilinca R, Pavel O, Ghiran V, Muschevici D, et al. Plasma and cerebrospinal fluid concentrations of magnesium in epileptic children. J Neurol Sci 1985;67:29-34. Avoli M, Louvel J, Pumain R, Olivier A. Seizure-like discharges induced by lowering [Mg 2+] 0 in the human epileptogenic neocortex maintained in vitro. Brain Res 1987;417:199-203. Steidl L, Tolde I, Svomova V. Metabolism of magnesium and zinc in patients treated with antiepileptic drugs and with magnesium lactate. Magnesium 1986;6:284-95. Lee C-H, Lü W, Michel JC, Goehring A, Du J, Song X, et al. NMDA receptor structures reveal subunit arrangement and pore architecture. Nature 2014;511:191-7. Ren XQ, Ma R, Yang CQ, Liu QH, Jiao J, Zhang XL, et al. Kangxian capsules: Effects on convulsive injuries, N-methyl-d-aspartate (NMDA) receptor subunit expression, and free Ca(2+) concentration in a rat hippocampal neuron epileptic discharge model. Seizure 2016;40:27-32. Finardi A, Gardoni F, Bassanini S, Lasio G, Cossu M, Tassi L, et al. NMDA receptor composition differs among anatomically diverse malformations of cortical development. J Neuropathol Exp Neurol 2006;65:883-93. Huggins DJ, Grant GH. The function of the amino terminal domain in NMDA receptor modulation. J Mol Graph Model 2005;23:381-8. Traynelis SF, Wollmuth LP, McBain CJ, Menniti FS, Vance KM, Ogden KK, et al. Glutamate receptor ion channels: Structure, regulation, and function. Pharmacol Rev 2010;62:405-96. Yuen AW, Sander JW. Can magnesium supplementation reduce seizures in people with epilepsy? A hypothesis. Epilepsy Res 2012;100:152-6. Fisher RS, Boas WE, Blume W, Elger C, Genton P, Lee P, et al. Epileptic seizures and epilepsy: Definitions proposed by the International League Against Epilepsy (ILAE) and the International Bureau for Epilepsy (IBE). Epilepsia 2005;46:470-2. Christis EF. Magnesium: Methods on CD-Rom. In: Lawrence AK AJ, Steven CK, editors. Clinical Chemistry: Theory, Analysis and Correlation. Missouri: Mosby; 2003. Nuytten D, Hees J, Meulemans A, Carton H. Magnesium deficiency as a cause of acute intractable seizures. J Neurol 1991;238:262-4. Kandel ER. Transmitter Release. Principles of Neuronal Science. New York: Elsevier Publishers; 1991:194-212. Smith W, Bone I. Copper, zinc and magnesium plasma levels in epilepsy. J Neurol Neurosurg Psychiatry 1982;45:1072. Blumenfeld H. Cellular and network mechanisms of spike-wave seizures. Epilepsia 2005;46:21-33. Pfeiffer M, Draguhn A, Meierkord H, Heinemann U. Effects of γ-aminobutyric acid (GABA) agonists and GABA uptake inhibitors on pharmacosensitive and pharmacoresistant epileptiform activity in vitro. Br J Pharmacol 1996;119:569-77. Abdelmalik PA, Politzer N, Carlen PL. Magnesium as an effective adjunct therapy for drug resistant seizures. Can J Neurol Sci 2012;39:323-7. Gaillard WD, Chiron C, Cross JH, Harvey SA, Kuzniecky R, Hertz-Pannier L, et al. Guidelines for imaging infants and children with recent-onset epilepsy. Epilepsia 2009;50:2147-53. Theodore WH, Dorwart R, Holmes M, Porter RJ, DiChiro G. Neuroimaging in refractory partial seizures Comparison of PET, CT, and MRI. Neurology 1986;36:750-0. Theodore W. Structural neuroimaging. In: Ho L, editor. Epilepsy Surgery. New York: Raven Press; 1992. p. 221-30.